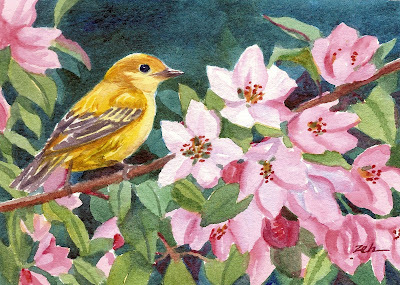 The other day, I looked out my studio window and saw this little warbler in my crabapple tree. The tree is loaded with blossoms and bees looking for nectar. The warbler was darting and flitting all throughout the tree. I know they eat insects, but was it eating bees? That I don't know, but it was a pretty sight to see this bright yellow bird and I couldn't resist painting it.